Sixteen-year-old Joy Montgomery, daughter of Zephyr the Magnificent, the great magician, can only reminisce of better times. Before the Superiors. Before the uprisings. Long ago. Before the dying Earth ripped the family she loved away from her. She can only dream of the adventure life must’ve been before their ancestors brought the apocalyptic devastation in the form of disastrous climate change. “Loved this book so much, from the very outset I knew this was a book for me that would immediately be all encompassing. For the few days that I was reading it I was totally invested in this dark world of terror and fear and it was all I could think about, for a long while I thought about the long suffering and selflessness of the main character Momma Joy, and how she pushed herself forward at every challenge. This dystopian setting had echoes of the misery of Orwell’s ‘1984’, it had the pace of action films such as ‘The Fifth Element’ or ‘Twelve Monkeys’, and I felt there was a little homage to ‘A town like Alice’… The Treemakers has the punch, detail, and depth of all of those combined. The realism was sublime, moments of realisation relating to Joy’s past really hit deep, made me smile, truly resonated within me, the darker moments too are just as hard-hitting, and make this book a dizzying rollercoaster of emotions. “The Treemakers” is an impressive debut from Christina L. Rozelle. Set in a dystopian future and after a cataclysmic event, the story is centered on the symbolically named, Joy, who lives in a world that is anything but. Joy is a central figure in the work force of “Bygonne”, which primarily consists of children. Working for a shadowy group, the children are slaves, charged with producing metallic trees in order to sustain oxygen for their world. In Bygonne, people figuratively and literally, struggle to breathe. The children are, however, as much a commodity as the materials they produce. Devoid of caring adults, Joy becomes the mother figure, trying to sustain some humanity in a world that relinquished it some time ago. Spinning hope, love and magic through her stories, Joy attempts to make sense of a world full of dangerous secrets. In Bygonne, however, hope, love, and magic can get you killed. So, too, can emancipation. 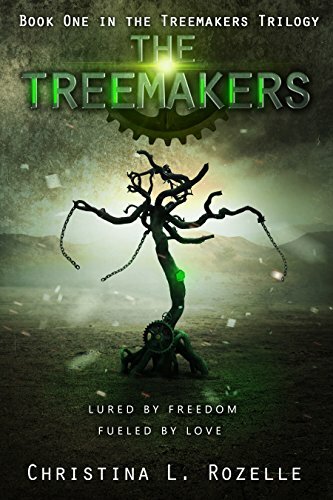 Told from Joy’s first person narration, “The Treemakers” is part environmental-warning and bio-punk. I’d recommend this work for readers of Young Adult and dystopian narratives.